This entry was posted in Card, SCRAPBOOK ADHESIVES BY 3L, Spellbinders, Tutorial, Uncategorized and tagged Blog Swap, Clearsnap, Core'dinations, Edgeabilities, Gina K. Designs, Nestabilities, Scor-Pal, Spellbinders. Bookmark the permalink. Love this card! I really like the way you used the Core’dinations card stock and spellbinders dies to put this together. Cute card! Interesting color combination. Simple and elegant! Gorgeous! I love the colors and all of the lovely details you created using the dies and card stock. Love the simplicity and elegance of this darling card! Love the card! The colors, and the embossing, wonderful! This card is simple, beautiful, and oh-so-elegant! 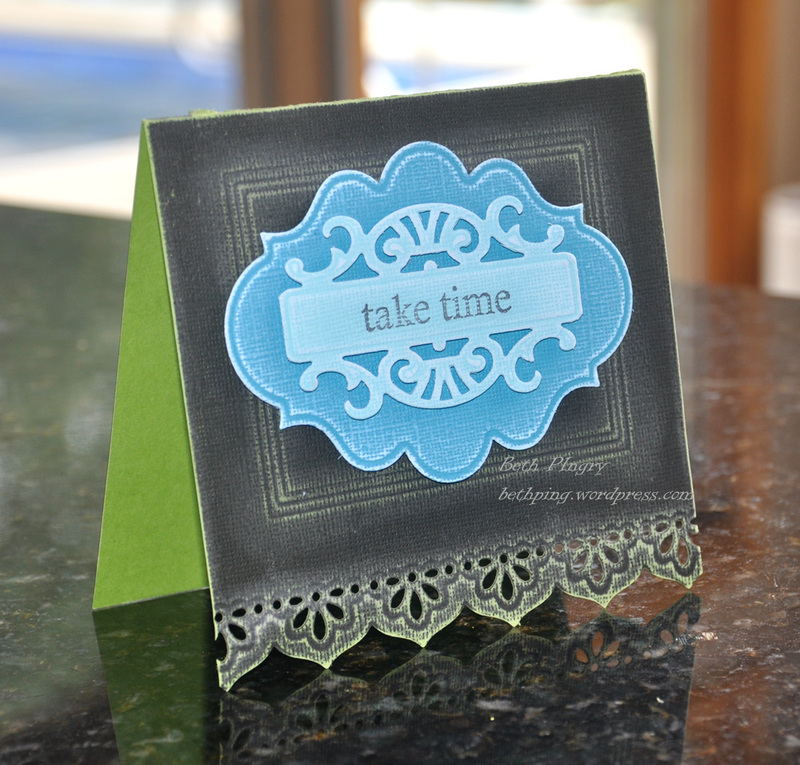 Love how you’ve used the dies plus cardstock! Fancy Tags 3 is still on my list, which only seems to get longer! Like your trick of embossing the rectangle, looks great! This is such an elegant card!! What a beautiful card! I love the colors and the dies you used. Very elegant. TFS. beth, really like the effect the embossed frame has on your lovely card. Beth, your card is one of my favorites. Love the decorative edging with the sanded Core’dinations paper and the way your layered your Spellbinder die cuts. Beautiful work! Love your card. Makes me want to play with my edgeabilities. Love your card. So inspiring. Now I want to go and play with my edgeabilities. Love your card. The texture is great. Beautiful card. That papers is wonderful with the embossing. I have one set of edgeabilities and I need more. Great cazrd. I love those edgeabilities! Very pretty!! I love the shades of blue you chose. Great job!! Such a great look using the Core’dinations cardstock for the embossing. And the petals edgeabilities is a fabulous die! Your card is more than cute and looks like you spent a ton of time on it! It is beautiful, thanks for the tips. The embossing here turned out AMAZING! Love it! Such a lovely card and the colors are fab. 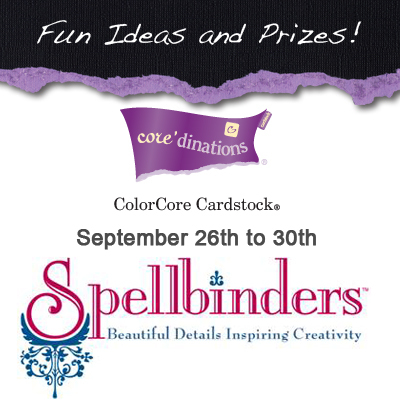 gotta LUV that Coredinations paper and spellbinders combo!!! what a beautiful card-great colors too! I really need to add some edgabilities to my growing collection of dies! Beautiful card, love how the core’ works wonderful colors. Thanks for sharing. I really like the distressed look you gave this card by sanding. Great job! Your card is not cute, it’s gorgeous!! Cute, easy and stunning! I am not very good at the simple style, so I admire you gals you can pull it off and make it look like a million bucks! Great job! Beautiful card love the colors and the dies. whit the sanding it makes this card look vintage. thanks for sharing and for the chance to win. Very beautifull card, love the color, thank you for sharing it. Very classy card–I like the dies you used and the colors. The colors are so soft and elegant. The whole card is just lovely. Well done. Great cards. Love the use of colors and Spellbinders dies. Gorgeous! The blue really pops on the black, love the beautiful dies! This card is awesome! 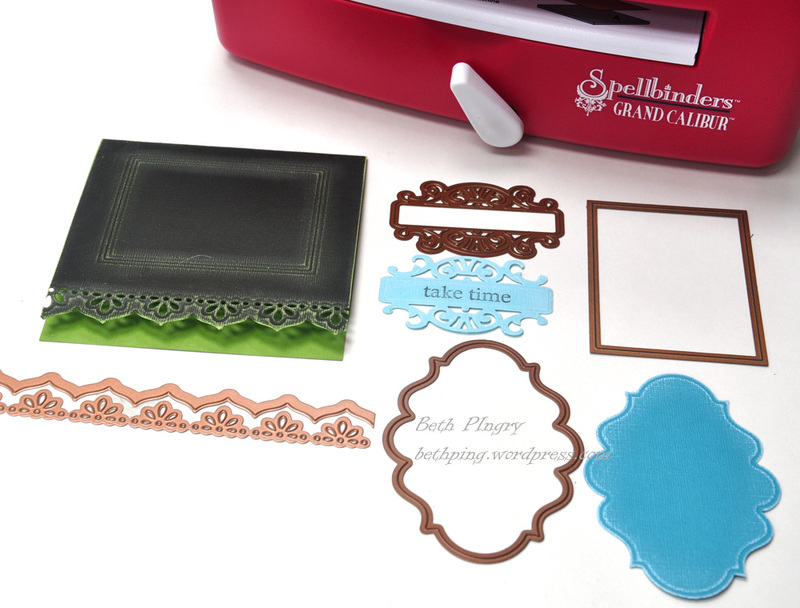 I am never disappointed when I view the designs from Spellbinders! And the Core’dination card stock is amazing! That’s very lovely! I can’t wait to start using all my new Edgeabilities. I love this colour combo – it makes a classic card so contemporary! Love the colors and easy way to make this card!! Way too cool and how easy!! Thanks for the creative push!! I too NEED those Edgeabilities dies (ALL of them, in fact)!!! They’re a huge MUST have for me — totally LOVE your card!!! Wonderful card Beth, love that color blue, great used of the die and paper!! Looks great! Wonderful card , it does look great and easy to do, thank so much for sharing!! Ah, have used Core’dinations for a long time in my card making; so this type of card is right up my alley! Gotta get some of the new Spellbinders Edgeabilities! Beautiful! Stunning! Love the colors! Quite handsome! Quick and easy w/beautiful results! I love how you have layered those labels. I really need to get some of the Edgeabilities. This is fantastic. I love the card! It is not made in colors that I would think to use but looks so good that I may have to try this color combination. Love the card it is so cute. Thank you so much for sharing. very nice card. love the simplicity. tfs. Spellbinders dies do so much of the work for you…leaves more time for embellishing! Love this! Gorgeous card! I just love that you used such a dark black/grey to offset the pretty blue. Thanks for the inspiration. I always love “cute & easy” things. The Spellbinders dies are the greatest thing ever and so easy to use. An awesome card here too. I just so love all these dies, and it´s sooo wonderful to come inhere and constantly find new ways to use them. Your card is just wonderful and looks sooo great and I love the colorscheme too. Amazing work. Oh, yes–that’s what I like to see–quick and easy yet visually stunning! I love the colors and textures and shapes you chose! A gorgeous card – elegant without being over done. Thank you for the inspiration. Beautiful Colors!! Simple but stunning!! Really pretty! I love the colors and sentiment!!! Beautiful work, Beth! Might be simple…but looks stunning! What a great idea to use the rectangle for just embossing…adds such a fantastic extra interest!! Beautiful ! I am going to buy the labels twenty !